Image source: For Filipinos in Europe (FFE). Colorized courtesy of Algorithmia. In the National Library of the Philippines document entitled “History and Cultural Life of Tanauan, Batangas1,” there is a brief item stating operations of the Hukbalahap (which we shall from this point on refer to as “Huk”) in the then-town of Tanauan. Doing follow-up research on the item above ultimately turns out to be an utter waste of time, because a Google search will simply yield mostly unrelated snippets of information on Huk activity in Batangas in the immediate post-war years. Not that this is even a curiosity because the Huk movement’s stronghold was really Central Luzon. There is simply a dearth of information on the subject over the Internet that writing a cohesive article is next to impossible. What this article hopes to do, therefore, is simply to collate the snippets of information with the intent of adding to the existing literature, which as already mentioned at the moment is very scarce. 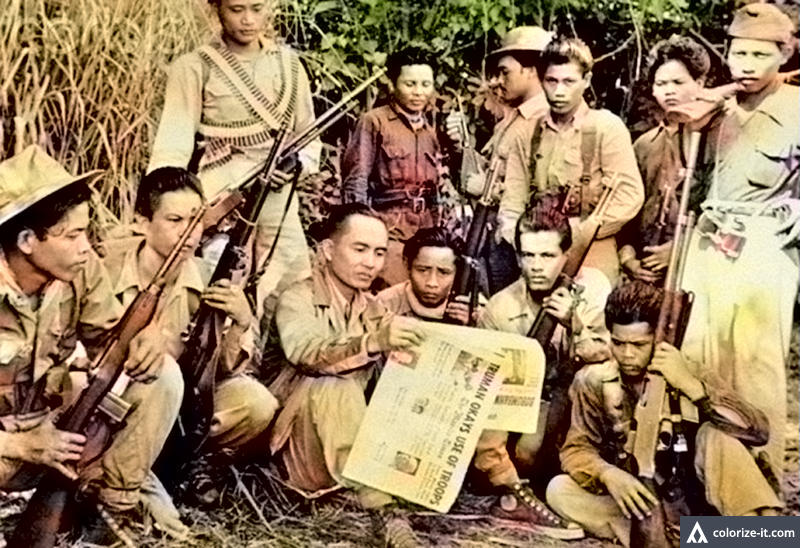 For the benefit of younger readers, the Hukbalahap was originally formed in 1942 to function as an armed group that would resist Japanese occupation of the Philippines. Hence, its name, which was a shortened version of “Hukbong Bayan Laban sa mga Hapon” (National Resistance Against the Japanese). The Partidang Komunista ng Pilipinas (PKP) in 1950 changed the group’s purpose into that of a revolutionary army and gave it the new name “Hukbong Mapagpalaya ng Bayan” (Liberation Army of the Country)3. Hence, many documents referred to the Huks henceforth as the HMB. Among the Huks’ members with Batangueño connections was Mateo del Castillo, who was among the highest ranking members of the PKP and, in 1945, named president of the “Pambansang Kaisahan ng mga Magbubukid” (National Union of Peasants)4. 1 “History and Cultural Life of Tanauan, Batangas,” online at the National Library of the Philippines Digital Collections. 2 This date has to be taken with a grain of salt. The anniversary of the Bolshevik Revolution in Russia is 7 November (Washington Post); the foundation of the Communist Party of China is 23 July (Wikipedia); the establishment of the Partidang Komunista ng Pilipinas was 7 November in 1930 (Wikipedia); and its splinter group the Communist Party of the Philippines was founded 26 December 1968 (Wikipedia). 4 “Communism in the Philippines,” Wikipedia. 5 “The Huk Rebellion: A Study of Peasant Revolt in the Philippines,” by Benedict J. Kerkvliet, published in California, USA in 1977. 6 “Notable Huk Kumanders,” online at The Kapampangan Historian. 7 “HMB Recruiting in Batangas,” dated 22 May 1950, declassified CIA file. 8 “Leaders of the HMB in Batangas Province,” dated 19 June 1950, declassified CIA file. 9 “The Huks And The New People's Army: Comparing Two Postwar Filipino Insurgencies,” by Major Rodney S. Azama, published April 1985, online at Global Security.